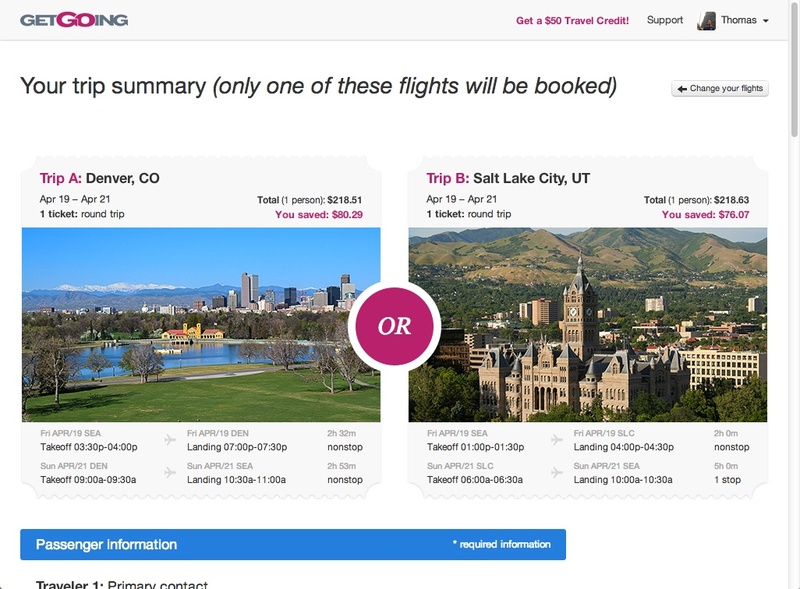 Software startup GetGoing is offering a new spin on opaque discounting in which shoppers choose discounted flights for two possible destinations, but don’t know which destination and airline they will get until they have entered their credit card details and clicked on the Purchase button. GetGoing offers an attractive and easy to understand user experience. My scenario was a late-season ski weekend from Seattle. I chose the “United States and Canada” region and entered the weekend of April 19 to 21 into the date fields. GetGoing listed prices for 19 possible destination cities from which I chose Denver ($200) and Salt Lake City ($205). For comparison pricing, I checked Hotwire and Priceline for opaque flight bookings (none were on offer). I checked Expedia and then did a Kayak metasearch to get prices for the two cities from several popular OTAs and airlines. The best I found were $288 for Denver and $264 for Salt Lake. The one other option a budget traveler might consider would be to bid for a fare on Priceline using their “Name Your Own Price” feature. Some of the recent winning bids promoted on Priceline were potentially lower than GetGoing but none were on the weekend I picked and there’s no guarantee that a bid lower than the GetGoing price would be accepted. Conclusion: GetGoing can offer significant savings if you aren’t fussy about which of two places you want to fly and it’s kind of fun to use. I [Thomas] often see articles like this and they can be hit or miss depending on whether they were compiled by a real-life frequent traveler. This one is the real deal [shout out to Denise Jones for finding it]. I don’t know that everything listed is an “essential,” but he does call out some good gear that both Denise and I have used and can vouch for. Osprey travel packs: I purchased an Osprey 40 carry-on-size pack for my last trip and it was super. With Osprey’s lifetime warranty, you can’t go wrong. A big +1 on the Monster Outlets to Go Strip. How something so functional, useful and inexpensive came out of a company infamous for overpriced, unnecessary products is beyond me but this is a great little piece of gear. I took one on a recent trip to Hong Kong and China and was pleased to see that its blue power indicator lights up regardless of whether the strip is plugged into a 110 or 220 volt source. They even make a version with a USB power port. Please note that this is not a voltage converter—just because it provides North American style plugs doesn’t mean you can safely plug a 110-volt-only device into it when you’re using a 220V supply. Luckily most modern electronics adapters work on any voltage from 100 to 220V—check the small print on your devices. Some hotels may have hoped that Google Hotel Finder (GHF) would drive more direct bookings for hotels at the expense of OTAs. However, it has been 20+ months since GHF launched and that has not been the case. This is because OTAs, with a much larger inventory than hotels, can better monetize GHF’s pay-per-click traffic. As I have pointed out, Google is just monetizing traffic that used to be driven for free from organic search results. The end result is that Hotels and OTAs are all now paying a “Google Tax” to get the same traffic they used to get for free in organic search. Google was investigated by the Federal Trade Commission for this and other alleged antitrust violations. Unfortunately for Hotels and OTAs, the FTC decided not to take any action against Google. Despite this, Henschtel thinks that most consumers are creatures of habit and will continue to book through the same OTAs and Hotels as they used prior to GHF’s launch. China has recently grown into the biggest consumer of travel products and services. I came across so many China-related articles for this edition that I decided to put them under their own heading. The Island of the Gods (Bali) from Returning To Nomadism on Vimeo.